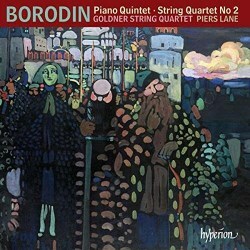 Borodin is justly famous for his Second String Quartet, which is included at the end of this disc, but the primary focus here is on his earlier Piano Quintet, placed first and coming in a series of recordings of other examples in that genre by a variety of composers, surveyed by the same forces as here. The Quintet was composed in 1862, just before Borodin met Balakirev and became a part of the ‘Mighty Handful’ of Russian composers, but there is already a Russian character in the folksong-like theme of the opening movement, and in its cyclical development over the course of three movements, eschewing the more typically Germanic sonata form. After the sensitive opening statement of the principal melody by Piers Lane on the piano, the Goldner String Quartet follow suit with a generally cautious and lyrical approach to its working out. There is a Brahmsian wistfulness in the second subject, but overt passion is kept at bay in the music’s more burgeoning passages. As well as sounding somewhat boxed in, Lane tends to defer to the string instruments, so that they are never occluded by the piano’s more percussive timbre, not even in the more strenuous finale. The Goldner’s cellist, Julian Smiles, comes to the fore in the Sonata of 1860, written for Borodin’s own instrument. Only parts of the manuscript survive, and so it is played in the completed version Mikhail Goldstein, published in 1982. Although something of a maverick, his reconstruction coheres neatly and consistently enough to give a fair idea of what Borodin had in mind. It is another composition of cyclical development, taking its cue from the fugal motif of Bach’s Sonata for solo violin in G minor, BWV1001, which is played around with, worked obsessively, dissolved, and rebuilt in myriad guises. Smiles tends to sound withdrawn and passive in relation to Lane’s part on the piano. The dreamy composure of the slow movement’s first part is ideal, but elsewhere there is no danger of wearing his heart on his sleeve where a slightly more effusive performance, either here or in the long-breathed melodies which occasionally emerge in the otherwise skittish finale, would have been no bad thing. Consistent with the rest of the programme, the Goldners bring soulful, restrained feeling to their performance of the String Quartet No. 2, where the richness of Borodin’s melodic invention comes to the fore, not least in their languidly lilting way with the first movement’s opening theme. But it remains emotionally cool (it would be unfair to say cold) subsequently in that movement, as also in the ‘appassionata e risoluto’ middle section of the famous Notturno and in the ‘pesante’ answering phrases for the viola and cello of the finale, where those markings are set aside by the performers. More dramatic tension could also emerge in the music around the pregnant pauses of that finale. The performance of this work by the appropriately named Borodin Quartet remains a benchmark for its more rounded and intense view of the whole offering more in the way of dynamic variety. But the Goldner’s interpretation offers another, valid stance on it, with a relaxed character that is drawn with consistent appeal, in this composition as well as the two others. Taken together, the disc provides a compelling insight into the chamber music of a composer better known for his small output of orchestral music and one opera.